Happy 2016, readers! At the Lowell Historical Society, we run across some interesting items in our collection of historical artifacts. There was the box of cinders donated by our former treasurer, Charles C. Swan, after a 1926 fire that consumed Pollards Department Store, one of Lowell’s largest and best known. Another cool find within our collection was the charred wooden stake that once formed part of the Central Bridge spanning the Merrimack River and separating Lowell’s Centralville neighborhood from its downtown section. Recently, we came across this pocketwatch, dated 1900, with its old-timey reference tag still attached. Among the oldest items in our collection, the watch remains in excellent condition, and exudes a sort of charm when its weight rests in your palm. And, it comes with history too. When Lowell’s Spanish-American war vets returned to the States in the last years of the 19th century, they brought with them their stories of war, and the artifacts they collected. This watch returned with one of them, retrieved from the ground by an American solider after one of the war’s battles, carried by that solider for the rest of the war, and brought to the US across the sea as he returned by ship over a century ago. Some years later, he donated it to our collection, where it remains today. One of the watch’s most interesting characteristics is its detail. From the name of the watch’s manufacturer on its face, Levy Hermanos (or ‘Levy Brothers’ when translated to English), to the Spanish coat of arms on its back, the watch is undoubtedly Spanish in origin, and one of our more unique artifacts in that its story starts far outside the borders of our city. Donated so long ago to our collection, the watch, and its story, are still remembered for today’s generations, and preserved for future generations as well. Like other items of this age, the tag has become almost as interesting as the artifact itself. 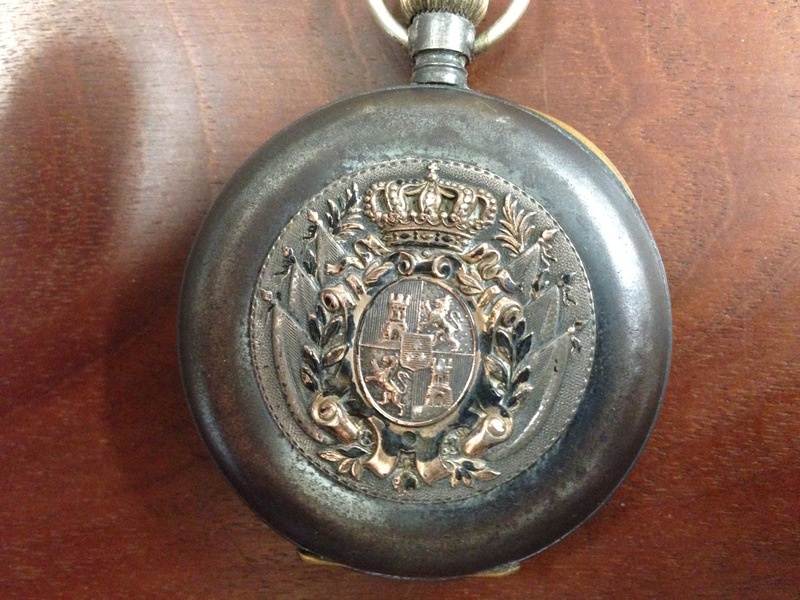 This pocketwatch is one of the items in the collection that we are researching right now. Watch this blog for further updates as we research other items, and post our research here. Hi Joanne – Thanks for stopping by, and commenting! I’ve got my grandfather’s too. It’s more of a WWII vintage watch, than this one from the 1890s. I’ve always loved pocketwatches, especially those with a little bit of history behind them.